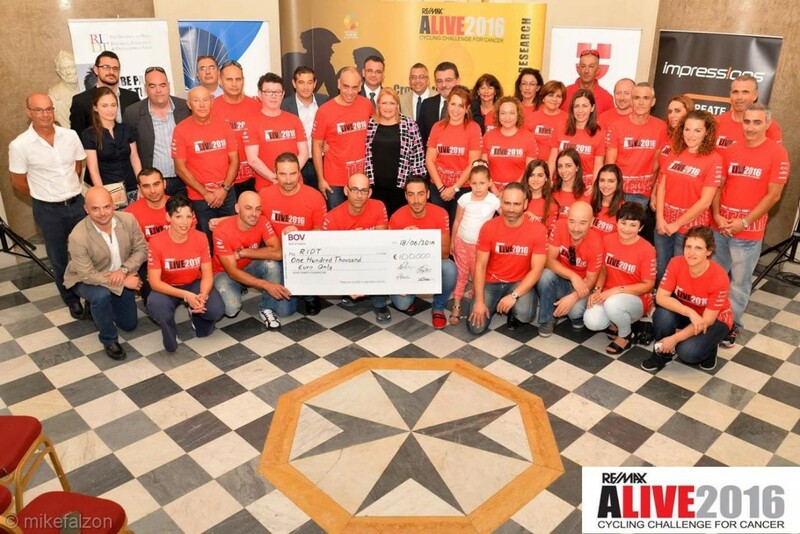 ALIVE Charity Foundation presented another record sum of €100,000 to the Research Trust of the University of Malta (RIDT) to further the University’s specialised programme in cancer research for children. The generous sum was collected by ALIVE cyclists who bravely ventured into the gruelling challenge across seven countries in seven days covering almost 160 km every day from the Alps to Sutton in UK. Held at San Anton Palace, the presentation from ALIVE2015 Cycling Challenge was presided by The President of Malta, H.E. Marie-Louise Coleiro Preca. 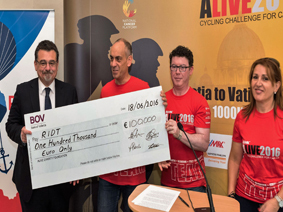 ALIVE Charity Foundation Chairperson Nicky Camilleri, on behalf of ALIVE committee and members, participating cyclists, main sponsor Daikin, all supporting sponsors, and friends, presented the donation to University of Malta Rector and RIDT Chairperson Professor Juanito Camilleri. Also present were Parliamentary Secretary for Research, Innovation, Youth and Sport Hon Chris Agius, Opposition Spokesperson for Local Government, Youth and Sport Hon David Agius, Dr Pierre Schembri Wismayer from the Faculty of Medicine and Surgery, and Consultant Paediatric Oncologist and President of Puttinu Cares Children’s Cancer Support Group Dr Victor Calvagna. ALIVE2015 was held in collaboration with Puttinu Cares. In three weeks time, the RE/MAX – ALIVE2016 Cycling Challenge for Cancer will take the cyclists from Croatia through Slovenia, northern Italy to the Vatican City. A gruelling 1100km will be covered in just seven days. Long hours of regular training are being covered by participants in preparation for this marathon. The RE/MAX – ALIVE2016 Cycling Challenge for Cancer will be supporting once again children’s cancer research. With the support of RE/MAX and Friends Foundation, ALIVE will also be converting a large courtyard into an outdoor play area and furnishing an indoor play area specifically for the children undergoing treatment at the Paediatric Unit within Sir Anthony Mamo Oncology Centre. Dr Schembri Wismayer explained that this year the funding will go towards a Ph.D project to use the initial successes in leukaemia differentiation, and study its’ possible applications in brain cancer research. He said: “One can roughly group cancers into two types, those which one can only get as an adult, such as lung cancer, stomach cancer and melanoma, as well as those one can get both as an adult or as a child, such as leukaemia and brain tumours. Our laboratory works on immunotherapy as a method to target the first group of cancer patients, and differentiation therapy as a method to target the cancers which can also occur in children. The idea of these differentiation studies is to develop drugs which make cancer cells grow old and die naturally (differentiate). Both natural products as well as synthesised chemicals from chemistry laboratories of colleagues around Europe (through the STEMCHEM consortium) have been tested and a number of successful candidates are being further studied. We have evidence that some of these potential leukaemia drugs can also work on other childhood tumours like bone cancers and with this funding, we wish to turn this research also onto brain tumours or gliomas,” said Dr Schembri Wismayer. The RE/MAX – ALIVE2016 Cycling Challenge for Cancer is being sponsored by RE/MAX and Friends Foundation, Powered by Garmin, Wurth, Tum Invest, Pro Action and Supported by Impressions Ltd, SIS, Wheelwizard, Danusan, Airmalta and the Malta Police Force. Please help keep this good cause ALIVE!